Ambi Climate wants to democratize smart home climate control with a device that brings learning climate management to standalone window air conditioner units, central air systems, freestanding systems or the single room machines more common in Europe and Asia, so long as the existing system can work with an IR-based blaster or remote. It originally launched in July on Asia-specific crowdfunding site Crowdtivate, but now it’s looking to expand its audience in North America. The hardware startup is kicking off its product launch on Kickstarter today, aiming to raise $25,000 to make its project a reality. The team already has a functional prototype built, with a near-final design that features a small hub device with micro USB power supply, IR transmitters for communicating with air conditioning units, and 802.11n Wi-Fi, plus BLE for iBeacon functionality. The hub unit can receive commands from your devices via Wi-Fi and beam them through IR to your AC unit, but it’s not just a remote – it’s a learning system that’s meant to pick up on your arrival/leaving times, temperature preferences throughout the day, sunlight, internal and external temperature, movement and more to automate your home climate control. The startup has built its own proprietary software algorithms to make this possible, in addition to creating the sensor-laden Ambi Climate device. It tries to maximize the energy efficiency of your system while keeping things comfortable, and the founders claim that it can cut your energy bill by up to a third when used constantly. There aren’t any tools for installation as with other options like Nest, and it works even with apartment window air conditioners, so long as they’re new. The IR method might actually not be compatible with a lot of central air systems that Nest would work best for, so Ambi Climate might be well-positioned to pick up the parts of the market not covered by the Google-owned firm. Early backers can also pick one up for just $49 per unit, which is $100 less than the company expects to charge when they ship in June 2015. If you can’t wait, there’s a beta edition available for delivery by the end of November of this year, which is rare for a crowdfunded project. 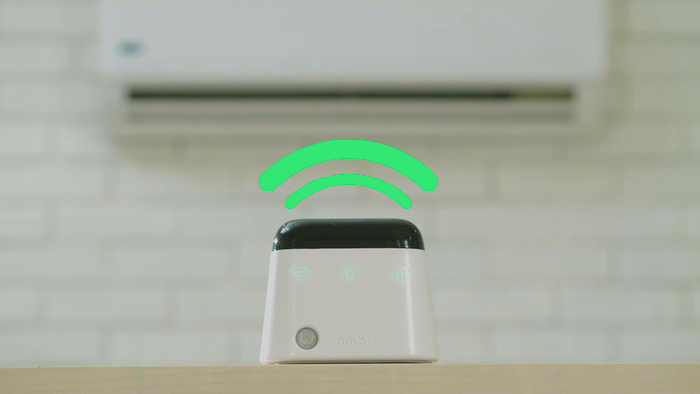 Ambi Climate is the product of Ambi Labs, a startup founded out of Hong Kong hackerspace Dim Sum Labs. CEO and co-founder Julian Lee has a long history of executive roles in the startup space and at Accenture. Chief Software Architect Timothy Chang was a developer at RIM as a student before moving on to become a software developer at MD provider The Institution. And Chief Hardware Engineer Paul Sykes has a history of designing hardware and software for the pharmaceutical industry and radio and TV broadcast.